This is one of our motor coach Jordan tours. Visit Madaba, visit Mt. Nebo. Tour Petra for a full day. Go off road by 4X4 in Wadi Rum. Upon arrival at Amman International Airport, you will be met by a Ya'lla Tours USA Jordanian representative and transferred to you hotel in Amman for overnight. Drive south on the Kings’ Way towards Petra. Stop at Madaba to see the famous ancient map of the Holy Land and the Mosaic School. Continue to Mt. Nebo, the traditional burial site of Moses, overlooking the Dead Sea and the Jordan Valley. Drive on through the magnificent scenery of Wadi Mujib to Kerak to visit the Crusader Castle. Arrive in Petra for overnight. Spend the day touring the many sites of Petra, this city that was carved into the rose-red Sharah Mountains by the Nabateans and lost to civilization until re-discovered by the Swiss Burkhardt. Walk through the Siq, a narrow and winding fissure between the cliffs, to reach the Treasury, the Roman Theater, the Courts, Qasr Bint Pharaoun, Temple of the Winged Lion and other many monuments. Drive to Wadi Rum and take a short 4x4 vehicle-ride into the awesome moon-like landscape, where the film “Lawrence of Arabia” was shot. Continue for drop-off at the Araba border crossing, Aqaba, or Amman. 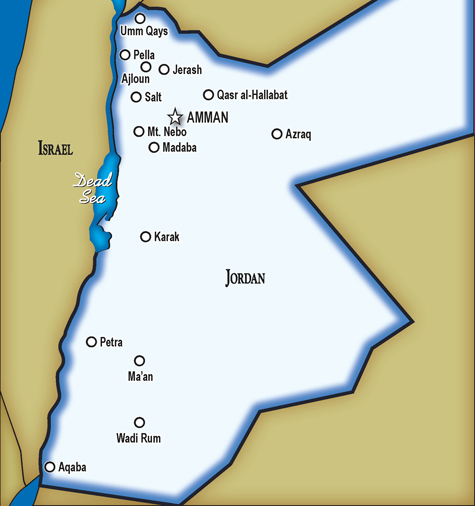 OPTIONAL: Aqaba or Amman hotel nights, or transfers and hotel nights in Eilat, Israel.